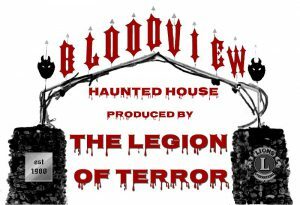 Bloodview and their legendary acting troupe, Legion of Terror, have been a must-see in the Cleveland area haunted house scene for 38 seasons. On the evening we visited, just as last year, there were fire performers with a stage set up across two separate queue lines to keep guests entertained as they waited. It was a cold, rainy night when we went, and the fireballs ejected from the performer’s mouths were actually a pretty nice momentary respite from the cold fall evening. Bloodview is a charity haunt that operates with a dedicated and volunteer cast and is produced by the Broadview Heights Lion’s Club. This was an extremely difficult review for us to write. The folks at Bloodview are friends of ours and, this year, they seemed really off their game. There were less than ideal weather conditions when we went to see Bloodview, and as such, there was a noticeable lack of actors in the haunt, especially in the outdoor areas. While many of the actors were summoning the maximum effort to push them through the night, there were still a number of performers who must have been quite tired by this point as they were off their timing and unable to recover their scares when spotted before their cue. We recognize that the miserable weather must have chased off some actors and worn down others, but we can only report on what we see, so Bloodview sadly lost some points from us in this area. We would like to recognize the clown strolling through the outdoor midway, who not only was not dressed for the weather, but he recited a super long string of dead baby jokes to us, which we previously believed to be a lost art form. Also, as a charity/volunteer haunt surrounded by paying haunts, Bloodview was hit hard for actors this year. We were able to take a behind-the-scenes tour of their facilities and one of the things that struck us as impressive was their massive wardrobe. Unfortunately, many actors did not choose to wear those costumes on the night we went and instead opted for non-descript black robes. Makeups were appropriate for the characters and zones, but there were very few that stood out. There was a winged demon creature inside the second building that did have a pretty spectacular ensemble and a Dead Baby Clown were both quite memorable in appearance. Bloodview is pretty easy to find. There is a lighted sign out by the main road directing you towards the street of warehouses where the haunt resides. GPS takes you straight there, and there are a number of parking attendants at the front gate to guide you towards the parking area. There were lots of signs and guide ropes indicating the flow of traffic as well. Right inside the main gate is the ticket booth, where the ticket booth operators got us situated with our wristbands and sent us to the sheltered queue line. One of the neatest things about Bloodview’s facilities is the fact that it’s been around for so long. The grounds have a very “lived in” feeling that can’t be fabricated in a newer haunt. The imposing archway at the front entrance, the overgrown grass around the property and the aged airbrush art on the tarps protecting the queue line all add to the creepy yet home-y ambiance of the haunt. This haunt is extremely actor-driven and doesn’t make use of any animatronics. All we noticed with respect to non-actor special effects were a vortex tunnel and a loud vibrating floor panel near the exit of the first building. The scenes were, as always, meticulously decorated with analog props and excellent lighting design. We didn’t notice a huge number of new additions this year, but what we did see was nice. Bloodview is strictly old-school and actor-driven, it’s just a shame we didn’t see more actors while we were there. Bloodview seemed to be off on their game during our visit and we are not used to seeing them perform at this level. There were a few actors that were struggling through the cold and rain to deliver some great scares, but overall it felt like most were just “phoning it in” to pass the hours until closing time. They did make attempts to scare multiple members of our group. However, we often ran into actors out of place from their last scare that hadn’t reset yet and then they just wouldn’t really bother. It was a shame as we are used to seeing them in prime form. Our walkthrough took around 35 minutes, which puts their entertainment received per dollar spent value at 1.75 (which is higher than most). The fire show was not running as we waited to enter the first building, and there was also a noticeable lack of queue line actors on the night of our visit. Coupled with the fact that ticket prices are reduced at 10 p.m., there are fire performances to enjoy while waiting on select nights, and the fact that you can go through the haunt as many times as you want on the same night, this makes tickets at Bloodview a decent value.